Along with fighting aliens and gathering resources, some missions involve building a tourist facility. In the 22nd century, tourists will pay big bucks to experience life in a working space colony. Catering to their needs can earn you a tidy profit. In order to build a thriving space hotel, start with a tourist port and at least one hotel. When you place these buildings, tourists will begin arriving. Each tourist pays 1000 credits as they check in. Tourists arrive and depart at 4-day intervals. How many arrive each time depends on the number of rooms available and the facility's tourism rating. To improve your tourism rating and monitor mission goals, check the Tourism Report in the Bridge Screen frequently. At the top of the report is your base's current tourism rating, from 0 to 10 stars. Below right are numbers indicating total tourists so far, current tourists and available rooms. On the left is a breakdown of the star ratings in 4 sub-categories: Entertainment, Health & Hygiene, Food & Drink, and Safety. Available Rooms - As you'd guess, single-, double- and triple-room hotels have one, two and three rooms. Place more or larger hotels for more rooms. Each room can hold a single tourist, couple or family. Better hotels attract more families, so more tourists overall. The overall tourism rating is an average of these four sub-categories. So you'll need 10 stars in all four categories for a 10-star overall rating. Heath & Hygiene - This is based on the number of medi bays and hygiene pods in the base, as well as base litter levels, which you can monitor on the Bridge Screen. Be sure to assign several operatives (or androids) to cleaning duty. As more tourists arrive, they drop litter throughout the base, so you'll have to keep after them. Food & Drink - This rating is fairly straightforward. 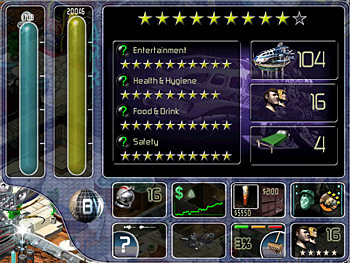 You'll need a variety of food & drink objects (i.e., mess halls, restaurants, bars and luxury bars) to score maximum stars. Be sure to keep them stocked with base nutrients and processed space chicken. Safety - To maintain a good rating here, you must keep your tourists away from harm. This includes placing automatic lasers or other military systems to protect from alien invaders, weeding posts to get rid of dangerous plants, and space defense shields to deflect meteor and volcanic showers. The safety rating also drops if tourist structures are damaged, not just the tourists themselves. General notes - Keeping base facilities maintained is also critical to a good rating. If objects break, assign someone to a maintenance post to get things fixed a.s.a.p. Add extra power generating facilities and oxygen plants as more tourists visit. It's also a good idea to keep your operatives happy and productive so they don't mix it up with the tourists. Stig and Nailer have both been known to punch tourists who got in their way. Imagine what that could do to your safety rating. In order to achieve maximum ratings, you'll need to take all these factors into account. The walkthroughs also give specific tips for each of the tourism missions in the game.